Emerald.Viridian. Virescent. Green! Blue. Aquamarine. Turquoise. Grey! Take away the colours from God’s palette and paint the skies and ocean of the Emerald archipelago - The Andamans, the dream destination of many a visitor to this heaven of tourism! It is a one and half hour flight from Kolkata to Port Blair. As the plane glided down and cascaded over the little city, the first view from above seemed ethereally fascinating - the ocean cupping up the island with an array of blue-tinted corrugated rooftops, overlooking the short runway canopied by a lush green backdrop! We began with Corbyn’s Cove Beach and the Ramakrishna Math. We reached on time for the Light and Sound show at the Cellular Jail. The structure is very articulately designed in consonance with the cycle-spoke design, each wing facing the back of the other. It was a blood curdling feeling as we watched and heard the gruesome plight of our martyrs of the Freedom Struggle. Every cell almost ‘spoke’ of their selfless sacrifice and the endless list of names on the marble plaques stands testimony to this! Our heads bow in deep respect to all who have given us this ‘day’ to be proud to call ourselves ‘Indians’! We then headed to see the newly erected 150-ft high Tricolour fluttering in the cool winds of the island. To commemorate the 75th anniversary of unfurling the National Flag (hoisted by Netaji Subhash Chandra Bose on 30th December 1943 and declaring the island free of British dominance) at the Gymkhana Ground (now re-named Netaji Stadium) our Prime Minister unfurled the Tricolour on 31st December 2018. We were also shown the exact spot where Netaji had hoisted the flag 75 years ago. The next morning we left for Havelock Islands (re-christened as Swaraj Dweep) by ‘Makruzz’, India’s first Catamaran Ferry. The cruise was an exciting and exhilarating experience! We checked in at the Dolphin Beach Resort, freshened up and walked down to the beach. Here was a palette of viridian, emerald, turquoise, green and blue, to pamper the eyes with the coolest colours ever available in God’s artistic finery! 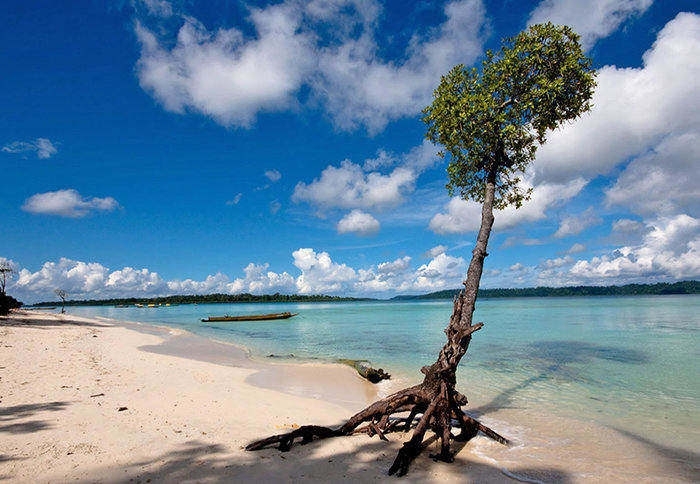 Havelock Islands is a picturesque natural paradise with rich coral reefs and thick green forests. It is also the most populated of the islands of Andamans. An early morning walk the next day revealed Nature’s beauty in its resplendence! The sea at about 5.30 am looked tranquil and deep blue. As the sun rose and the rays began to fall on the sea, the colours began to show, just like God’s own Magic painting book! The deep blue at the far end rippled over with deep viridian, slowly curling over the shore with turquoise and emerald green, a dash of yellowgreen and flowing down to a rush of foamy white! It was a sight to behold, to stand against an endless stretch of an ocean with specks of white ships sailing at the far end and behind me, a wall of mangroves, intermittently contoured by lush green coconut palms, completing the canvas of Nature at its best! One needs the quietude of mind and soul of a mendicant, to appreciate the beauteous bounty of Mother Nature, away from the chaotic humdrum of city life! That was Radha Nagar beach! As Shakespeare said, ‘Beauty lies in the eye of the beholder’, truly so, was my experience. Radha Nagar beach, which is a white sand beach, was rated amongst the best beaches in Asia on 2017 for two consecutive years. Visitors thronged in hordes to watch the sun set at its flaming orange-red best! The shimmering gold ripples danced over the sheet of the sea, probably acknowledging and thanking the Almighty for His benevolence! So incredibly astounding and gorgeous was the sight to see! The beach at Kaala Pathar, with a golden-white sand beach, was equally admirable. It is worth appreciating that this beach is clean, has a limited footfall, is small, but charming The flora and fauna soothes the heart and cools the eye! The islands are interspread with varieties of hibiscus and exora flowers. The densely covered jungle areas are full of huge ‘Pedauk’, ‘Garjan’, ‘Mohua’, ‘Akshay’, ‘Janglee Nimbu’ trees. On the habitable side, we have coconut, supari (betel nut) palms, banana trees in abundance. The tide being low, we hopped over huge corals and stones to reach the ‘bridge’! The Bharatpur beach is known to be the most spectacular and picturesque in the Neil island. The 30-minutes glass-bottom boat ride took us on a breathtaking view of the crystal clear deep aquamarine sea, with multi-coloured corals and marine life! We woke up to a rain-soaked morning, depriving us of the sunrise. A drive round the island took us through asphalted roads passing through huge betelnut and coconut palms lined on both sides. This island has a Government Sr. Secondary school and for all higher education both in Havelock and Neil Islands, one has to go to the mainland, either at Kolkata or Chennai. Recently a Medical College was opened at Port Blair. The cruise back to Port Blair, with ‘oceanic’ memories, was exhilarating! We checked in at Haywizz in the heart of the port-city. At 3 am, the next morning, we left for Jirkatang checkpost through the Jarawa Reserve enroute to Baratang Island. As luck would have it, we saw a couple of Jarawas and two men, all armed with bow and arrow, quietly walking down for their day’s hunt. The convoy of almost 100 vehicles quietly passed by, respecting their freedom! Our boat anchored at the backwaters of the island, etched with thickly forested mangroves, lined along the island, as we walked up the stretch of 1.2 km to see the Limestone caves. At the Jarawa creek, we climbed up 160 metres hill to see the ‘Mud Volcano’, tiny holes on the hill-top spewing up fluid of cement colour continuously! The next stop-over was at Ross Island. The lapping sea waves reminded one of the toil of our freedom fighters, on the other side overlooking the vast ocean, while the Imperialists made merry here! But, let us appreciate their futuristic thoughts - the Bakery, the drinking water treatment plant, the sewage treatment plant, the Ball-room, the open grounds and the small stadium-like structure where they spent their gala evenings in celebration and bonhomie! The withered structure of the Presbythean Church stands as a monument of religious pride of the Britishers.